Held the third week of June, IAVAT conference allows members to set policy, review organizational structure, complete committee work, and engage in top-notch professional development. Held in the fall, this two-day workshop focuses on providing educators in the first five years of teaching tips, tools, and techniques for developing strong agricultural education programs. Held twice through the year, student members have the opportunity to learn from mentor teachers how to build quality agriculture programs, navigate the forms and requirements of FFA, and construct hands-on learning labs for students. These events are special projects of the Ag Ed Recruitment/Retention Committee. ﻿Use the link below to view/download materials from professional development at 212 Conference. 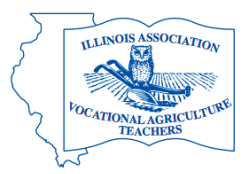 Sponsored by FCAE, Facilitating Coordination in Agricultural Education, as a special project funded by the Agricultural Education Line Item, Continuing Education courses are available for teachers to earn graduate credit in a variety of areas. Ag Ed 499 - Beginning Agriculture Teachers Course: Graduate course designed for first-year teachers in order to supply them with the knowledge and skills necessary to get their career started off on the right foot. Others as identified by the membership and the FCAE staff. Engage in advocacy at the national level with the National Policy Seminar! This three-day event will provide advocacy training, engage participants with governmental speakers, and offer opportunities to meet 1:1 with legislators in both the House and the Senate.